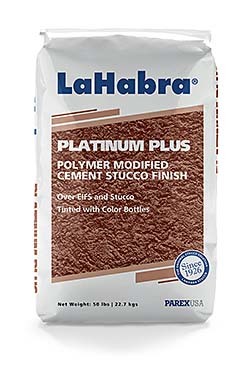 LaHabra Platinum Plus is an acrylic polymer modified cement stucco finish for use over EIFS and stucco. Has 100 percent higher impact resistance over stucco basecoats than traditional cement stucco finish or stucco grade acrylic finishes. Tinted with acrylic color bottles. Offers greater color consistency than traditional cement stucco finishes, according to the company.